The Trinity was band active in the 60s, led by keyboardist Brian Auger and usually featuring singer Julie Driscoll. In 1968 Brian Auger & The Trinity scored a #5 hit in the UK with their psychedelic cover of Bob Dylan's "This Wheel's On Fire", featuring Julie Driscoll on vocals. Subsequently their debut album sold much better. The group's next album actually did not feature Driscoll, so was far removed from the sound of their one and only hit. 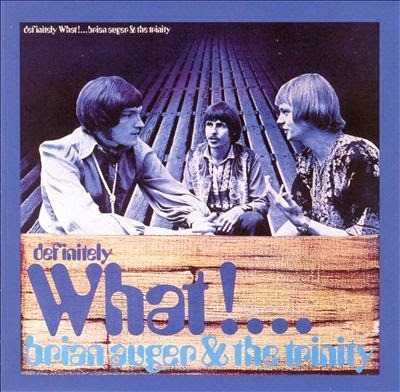 Definitely What!, released the same year, was an almost entirely instrumental album, the band now featuring the trio lineup of Brian Auger (keyboards/vocals), Dave Ambrose (bass) and Clive Thacker (drums). Its sound was that of a jazz/R&B fusion, with occasional psychedelic overtones and Auger's jazzy organ playing as the main focus. The trio were augmented on much of the album by a large horn section. Much of the album consisted of Auger originals, though there was also an ambitious arrangement of The Beatles' "A Day In The Life", and covers of songs by both Mose Allison and Booker T. & The MGs.